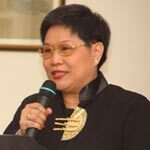 Concepcion “Chit” Asis, the coordinator of the Friedrich Naumann Foundation’s (FNF) Alumni Group in the Philippines, has been appointed as the new director general of the Liberal Party (LP) National Headquarters by LP President and Senate President Frank Drilon. The Foundation’s Resident Representative Dr. Ronald Meinardus was among the first to wish her well. “We at the liberal Foundation are more than pleased to see an old friend in charge at the Party’s headquarters,” said Dr. Meinardus. Ms. Asis replaces Mr. Eleazar “Eli” Quinto, under whose direction the relationship between the LP headquarters and the Foundation’s Philippine office has prospered. Before her appointment, Ms. Asis served as chief of staff of former LP Senator and ex-Party President Wigberto “Bobby” Tanada. During last year’s election campaign, Chit, as she is commonly known among her many friends, played a leading role in the Liberal Campaign Coordinating Council (L3C). The FNF Alumni Group is a network of liberally minded political leaders from the Philippines who have attended leadership trainings in Germany and other countries sponsored by the liberal Foundation. The group regularly holds lecture meetings and social gatherings at which political and other issues are discussed from a broader liberal angle. At present, the group has more than 120 members.